This tutorial is only intended for users running the Firefox Web browser on Linux, Mac OS X, and Windows operating systems. It is very important to keep your Firefox browser updated to the latest and greatest version available. There are two main reasons for this, and they involve security and functionality. First, many browser updates are released to correct security flaws found within the previous version or versions. It is imperative that you maintain the latest update of Firefox to minimize exposure to possibly harmful vulnerabilities. Second, some browser updates include new or enhanced features which you want to take full advantage of. Firefox has its integrated update mechanism, and its settings can be configured to your liking. Update configuration can be achieved in a few easy steps, and this tutorial will teach you how it is done. First, click the Firefox main menu represented by three horizontal lines and located in the upper right-hand corner of the browser window. When the pop-out menu appears, select ​​ Options or Preferences. Firefox's Options/Preferences interface should now be displayed in a new tab. Click Advanced, located in the left menu pane and highlighted in this example. Next, select the Update tab found in the Advanced Preferences header. The first section in the Update tab, labeled Firefox updates, contains three options each accompanied by a radio button. They are as follows. Automatically install updates: Enabled by default, this setting ensures that Firefox remains up-to-date without any manual intervention required. If any of your existing add-ons will be disabled by a browser update, you will be warned beforehand. If you would like to disable said warnings, remove the check mark next to Warn me if this will disable any of my add-ons by clicking on it once. Check for updates, but let me choose whether to install them: When enabled, Firefox will always check to see if a browser update is available. However, it will not install these updates unless you specifically allow it. Never check for updates: Unless you have a specific need to disable Firefox updates, enabling this option is strongly discouraged. Located directly below these options is a button labeled Show Update History. Clicking this button will display detailed information on all the major updates that have been applied to your browser in the past. The final section on this screen, labeled Automatically update, allows you to dictate which additional items other than the browser itself will be updated without user intervention. In the example above, we have chosen to have all of the installed search engines updated automatically. To designate an item for automatic updates, simply place a check mark next to it by clicking on the box once. To configure the opposite behavior, remove the accompanying check mark. Windows users will notice an additional option not available on other operating systems, located below the Show Update History button and labeled Use a background service to install updates. 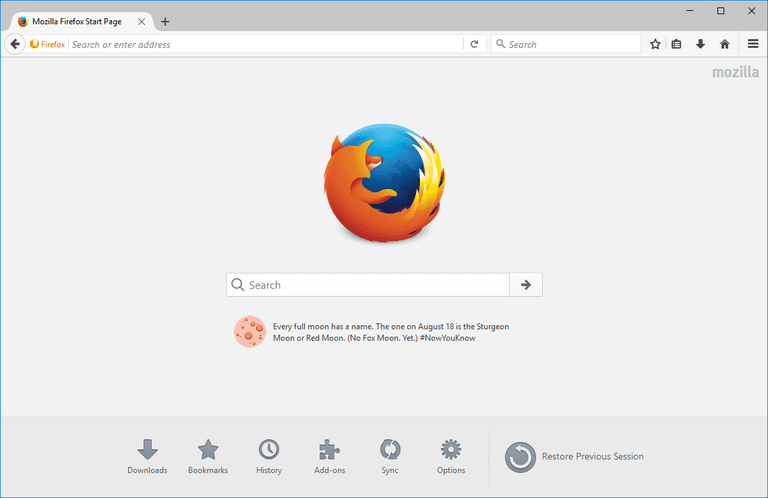 When enabled Firefox updates will take place via the Mozilla Maintenance Service, meaning that the user will not have to approve the update through a Windows User Account Control pop-up.